Very Inspiring Blogger Award–Who, Me? 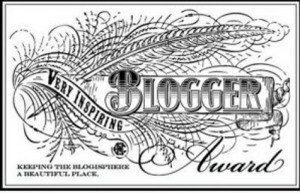 The lovely Tallulah Rose has nominated yours truly for The Very Inspiring Blogger Award. Yes, very inspiring. Go and read Tallulah’s post. She has led a colorful life and is far more inspiring than I. 1. I love guinea pigs but my daughter is allergic to them. It’s irony at its cruelest. Now we have a horribly hairy dungeon rabbit, which is no guinea pig substitute, let me tell ya. 3. Once my sister and I were laughing so hard that she peed her pants. Then I laughed so hard at her pants-peeing, I peed my own pants. That was last week. No, not really. Maybe. 4. My BFF’s useless superpower is acid sweat. 5. Actually, that may not be too useless. 6. The previous was not something about me. Neither was the one before that. Ack! I’m blowin’ it man! I don’t have a useless superpower, but dammit I want one. Crappy list-writing is my useless superpower! 7. There’s a little black cat on my deck today. It’s the same old cat as yesterday. Her name is Elphie (Elphaba) after the witch in “Wicked.” I really need to read the second book in that series. Okay, that’s not 15, but I’m tired of this linking business. No more Chinese food for me, Ma! This entry was posted on Tuesday, January 22nd, 2013 at 8:32 am	and posted in Uncategorized. You can follow any responses to this entry through the RSS 2.0 feed. Your pictures are always inspiring, Rincewind. 😉 I look forward to reading your post! Hoe cool are you? Thanks and keep up the good work!